Coordinates: 48°49′45.55″N 2°13′12.64″E﻿ / ﻿48.8293194°N 2.2201778°E﻿ / 48.8293194; 2.2201778 The International Bureau of Weights and Measures (French: Bureau international des poids et mesures), is an international standards organisation, one of three such organisations established to maintain the International System of Units (SI) under the terms of the Metre Convention (Convention du Mètre). The organisation is usually referred to by its French initialism, BIPM. The BIPM reports to the International Committee for Weights and Measures (French: Comité international des poids et mesures, CIPM), which is in turn overseen by periodic meetings of the General Conference on Weights and Measures (French: Conférence générale des poids et mesures, CGPM). These organizations are also commonly referred to by their French initialisms. 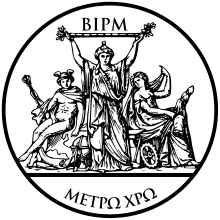 The BIPM was created on 20 May 1875, following the signing of the Metre Convention, a treaty among 51 nations (as of August 2008). It is based at the Pavillon de Breteuil in Sèvres, France, a 4.35 ha site (originally 2.52 ha) granted to the Bureau by the French Government in 1876, where it enjoys extraterritorial status, a status that was clarified by the French decree No 70-820 of 9 September 1970. Under the authority of the Metric Convention, the BIPM helps to ensure uniformity of SI weights and measures around the world. It does so through a series of consultative committees, whose members are the national metrology laboratories of the Convention's member states, and through its own laboratory work. The BIPM carries out measurement-related research. It takes part in and organises international comparisons of national measurement standards and performs calibrations for member states. The BIPM has an important role in maintaining accurate worldwide time of day. It combines, analyses, and averages the official atomic time standards of member nations around the world to create a single, official Coordinated Universal Time (UTC). The BIPM is also the keeper of the international prototype of the kilogram. Pavillon de Breteuil in Sèvres, France. 2013– Martin J.T. Milton (United Kingdom). ↑ "Brief history of the SI". BIPM. Retrieved 21 April 2009. 1 2 Page, Chester H; Vigoureux, Paul, eds. (20 May 1975). The International Bureau of Weights and Measures 1875–1975: NBS Special Publication 420. Washington, D.C.: National Bureau of Standards. pp. 26–27. 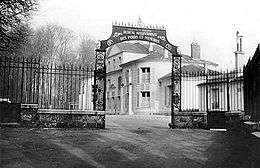 ↑ "History of the Pavillon de Breteuil § The BIPM from 1875 to the Present Day". BIPM. Retrieved 2015-09-09. ↑ "BIPM Time Coordinated Universal Time (UTC)". BIPM. Retrieved 29 December 2013. ↑ "International prototype of the kilogram". BIPM. Retrieved 18 November 2011. ↑ "Directors of the BIPM since 1875". Bureau International des Poids et Mesures. 2011. Retrieved 30 September 2012. ↑ "NPL Fellow, Dr Martin Milton, is new Director at foundation of world's measurement system". QMT News. Quality Manufacturing Today. August 2012. Retrieved 30 September 2012. Wikimedia Commons has media related to International Bureau of Weights and Measures.